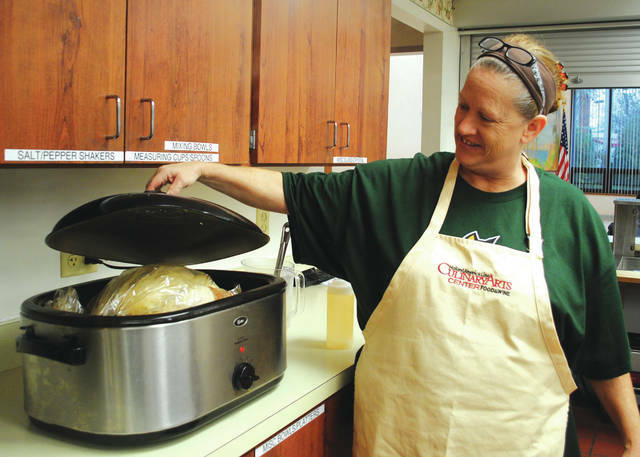 Whitney Vickers | Greene County News Darlene Matteson of the Fairborn Senior Center is cooking 30 turkeys Nov. 19-20 in preparation of Fairborn’s community Thanksgiving meal. Turkeys are being roasted and baked. FAIRBORN — No one has to eat alone this Thanksgiving — or that’s what Fairborn Senior Center Director Ellen Slone-Farthing is hoping. Slone-Farthing and her team, with the help of several local individuals, churches and organizations, are preparing to feed 500 community members this Thanksgiving holiday. The free meal will include classic Thanksgiving items, such as turkey, dressing, mashed potatoes, gravy, green beans, desserts and more. Two seatings are scheduled — the first taking place at noon and the second happening at 1 p.m. — at the Fairborn Senior Center, 325 N. Third St. The senior center can also deliver Thanksgiving plates to individuals unable to leave their homes on the holiday. As of Nov. 16, 150 individuals had signed up to take advantage of the option, but senior center officials were expecting more. The deadline to sign up for the deliver option is Wednesday, Nov. 21; individuals can sign up by calling the Fairborn Senior Center at 937-878-4141. The meals will start being delivered by 10:30 a.m. Thursday, Nov. 22. Turkeys started going in the oven in preparation for the event on Nov. 19 — a total of 30 birds. Some were roasted, while others were baked. 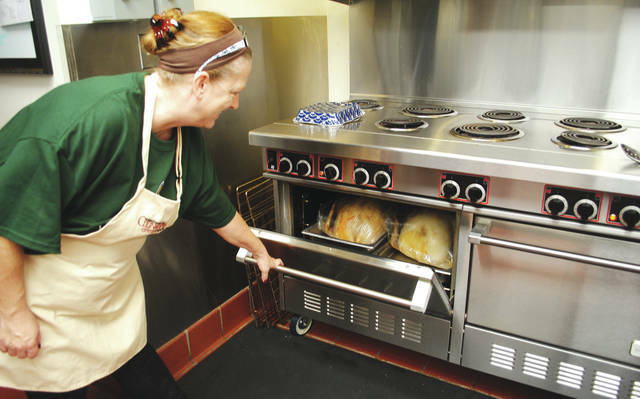 Darlene Matteson, of the Fairborn Senior Center, cooked 17 turkeys Nov. 19, preparing the remaining 13 birds on Nov. 20. The Thanksgiving items were made possible by donations by some local individuals, churches and organizations. Elmcroft of Fairborn, as well as some private individuals, donated the turkeys. Fairborn City Schools Board of Education Member Mary Reaster donated the mashed potatoes. Rona Community Church donated the green beans, while Melodee Restaurant donated all the dressing. All pies will be donated by local churches. Slone-Farthing said she has been putting the community meal together for 12 years, but the event had been taking place longer than that. If individuals wish to volunteer, they should contact the Fairborn Senior Center. https://www.fairborndailyherald.com/wp-content/uploads/sites/50/2018/11/web1_tgprep20181.jpgWhitney Vickers | Greene County News Darlene Matteson of the Fairborn Senior Center is cooking 30 turkeys Nov. 19-20 in preparation of Fairborn’s community Thanksgiving meal. https://www.fairborndailyherald.com/wp-content/uploads/sites/50/2018/11/web1_tgprep20182.jpgWhitney Vickers | Greene County News Darlene Matteson of the Fairborn Senior Center is cooking 30 turkeys Nov. 19-20 in preparation of Fairborn’s community Thanksgiving meal. 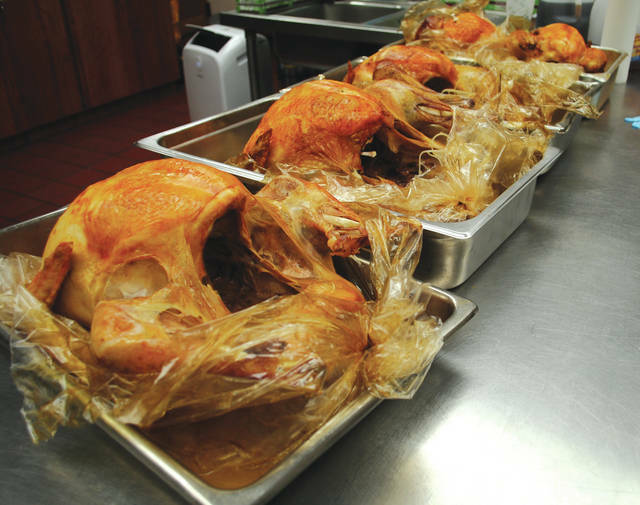 https://www.fairborndailyherald.com/wp-content/uploads/sites/50/2018/11/web1_tgprep20183.jpgTurkeys are being roasted and baked.